Democratic presidential candidate Hillary Clinton gives a speech on the economy after touring Futuramic Tool & Engineering, in Warren, Mich., Aug. 11, 2016. Peter Mansoor is a self-described "lifelong Republican" and a "foreign policy hawk." The retired U.S. Army colonel boasts an unswervingly conservative voting record. "I've voted for every Republican presidential candidate from Reagan to Romney," said Mansoor, who was the right-hand man to then-General David Petraeus during the Iraq War. But this year, with Donald Trump as his party's nominee, he just can't bring himself to pull the trigger. "Trump is fully unsuited to the office," Mansoor told VOA. "His temperament, his ego, his inability to control his words, all these things could get a president into deep trouble." Mansoor is one of a growing number of Republicans, especially within the national security establishment, who oppose Trump. Many, like Mansoor, are not only denouncing the GOP nominee — they're also taking the extraordinary step of endorsing his Democratic rival, Hillary Clinton. "I disagree with Hillary Clinton on a number of policies," he said. "But she, as a person, has the qualifications to be president. She's smart. She's measured in her speech. She has the ability to accept advice from advisers. She has the experience." The comments from Mansoor and other foreign policy hawks suggest they share a common worldview with Clinton, who during her time as a U.S. senator and secretary of state supported and oversaw interventionist policies in countries ranging from Iraq to Libya to Ukraine. Clinton's foreign policy views often stand in sharp contrast to those of Trump, though his record is at times wildly inconsistent (ranging from explicit calls to invade and occupy Middle Eastern countries and "take the oil" to proposals for the U.S. to show greater military restraint in the world). At this point, it isn't clear whether the bulk of the U.S. foreign policy establishment is voting for Trump or Clinton. But if "hawks" do turn to Clinton in significant numbers, it would represent a significant shift for a group that has for decades found a home in the Republican Party. 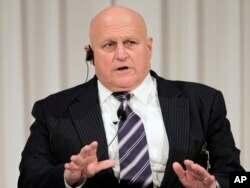 FILE - Former U.S. Deputy Secretary of State Richard Armitage speaks during a symposium of the 'Charges in Leadership and the Future Course of Japan-US-China Trilateral Relations' in Tokyo Friday, Oct. 26, 2012. The list of hawkish foreign policy leaders who support Clinton is getting longer by the week. It now includes several prominent figures, including ex-Deputy Secretary of State Richard Armitage, former Director of National Intelligence John Negroponte, and ex-CIA chief Michael Morrell, an independent, who recently wrote a New York Times editorial saying Trump "may well pose a threat to our national security." Others aren't explicitly endorsing Clinton, but appear to be leaning that direction. Former CIA Director Michael Hayden, who regularly criticizes Trump, said Clinton is the "best prepared" candidate, though he has stopped short of saying he will vote for her. Earlier this week, a group of 50 prominent foreign policy experts, including Hayden and many from George W. Bush's administration, signed a strongly worded letter saying Trump "would be the most reckless president in American history." Signees of the letter included two Homeland Security secretaries under Bush, Tom Ridge and Michael Chertoff, as well as Robert Zoellick, a former deputy secretary of state and World Bank president. Clinton has embraced the support of Republicans. Many of her campaign ads feature prominent Republicans slamming Trump. This week, her campaign launched a new effort to highlight and reach out to Republicans and independents, rolling out a "Together for America" website that includes the names of leaders who have crossed the aisle to support her. 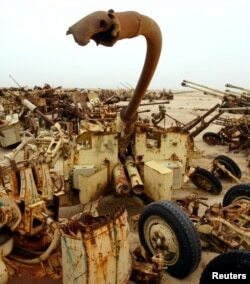 FILE - A destroyed anti-aircraft gun lies in a scrapyard in the Kuwait desert containing the remnants of an Iraqi army destroyed by coalition forces during the Gulf War. Nov. 5, 2002. At a rally Wednesday in Des Moines, Iowa, Clinton said she was "humbled and moved by the Republicans who are willing to stand up and say that Donald Trump doesn't represent their values, not only as Republicans but as Americans." "We may not agree on everything, but this is not a normal election," she said. "And I will work hard for the next three months to earn the support of anyone willing to put our country first." There are plenty of reasons why a candidate such as Clinton could appeal to foreign policy hawks. From her time as first lady during the presidency of her husband, Bill Clinton, to her time as a New York senator, to her four years as secretary of state under President Barack Obama, Clinton has regularly pushed for or overseen interventionist policies. She voted in favor of the U.S. invading Iraq in 2002. She supported the U.S. war in Afghanistan, favored a large troop surge there in 2009, and supports keeping a large presence there through the end of Obama's presidency and perhaps beyond that. She also played a major role in the NATO-backed intervention that removed the late-ruler Moammar Gadhafi from power. More recently, Clinton has called for the Obama administration to take a tougher approach to the civil war in Syria, favoring arming rebels fighting against President Bashar al-Assad. She has also said she wanted the U.S. to do more to respond to Russia's annexation of Crimea and other destabilizing moves in Ukraine. 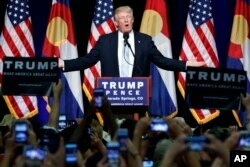 Republican presidential candidate Donald Trump speaks during a campaign rally in Colorado Springs, Colo., July 29, 2016. Trump broke a major taboo over the weekend by engaging in a feud with the bereaved parents of a decorated Muslim US soldier killed I Iraq. Clinton's record is an attractive package for many foreign policy hawks. "She is not the two-dimensional cartoon figure that the Republican Party has made her out to be," Mansoor said. "Especially in the foreign policy and national security realm. She's a lot further to the right than Barack Obama." Asked whether Clinton sees the international arena roughly the way he does, Mansoor replied: "Yes, I do. She believes in a liberal international order that the United States has helped create in the wake of World War Two, from which the United States has benefited greatly." Trump's views on foreign policy are largely a mystery. The lack of clarity stems in part from the fact that the billionaire businessman has no record of making national security decisions, having never served in elected office. Trump's statements on foreign policy are also erratic. On the campaign trail, he often refers to the Iraq War as "stupid" and uses it as an example of U.S. overreach. He also claims he was against the invasion, though several reports have indicated Trump in 2002 actually supported the U.S.-led war. Trump also regularly slams Clinton's role in the ouster of Gadhafi, which has helped lead to an unstable, largely lawless Libya that has become a safe haven for militants. However, Trump leaves out the fact that he is on record supporting that military effort, as well. 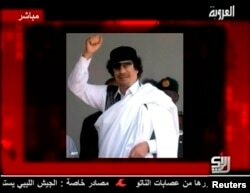 A still image of Libyan leader Muammar Gaddafi is displayed to accompany his audio message broadcast by Syrian TV channel Al-Orouba, Aug. 25, 2011. The former Libyan leader was killed in October, 2011. The contradictions in Trump's statements create difficulties for trying to determine what a Trump foreign policy would look like, said James Jeffrey, a former U.S. ambassador to Iraq and Turkey. "We do not know anything about what he would do. We don't know who he would listen to. And we don't know how he'd respond to recommendations. That's part of the problem," said Jeffrey, who signed the anti-Trump letter. "There's no indication that he even follows foreign policy," Jeffrey told VOA. Asked to sum up Trump's foreign policy views, he answered: "Two words: thread-bare and incoherent." One traditional way to determine a presidential candidate's foreign policy views is to examine the records of those who are advising him or her. But in Trump's case, that reveals little. Trump has only released the names of a handful of people advising him on foreign affairs, and the advisors were not well-known. VOA reached out to Trump's foreign policy advisors, but none responded. Last year, when asked from whom he gets military advice, Trump answered, "I watch the [television] shows." He also raised eyebrows in March when he answered the same question by saying: "I'm speaking with myself, number one, because I have a very good brain, and I've said a lot of things." While those comments and others have led to ridicule by many in the foreign policy community, Trump doesn't seem to mind. He's dismissed the criticism as a politically motivated publicity stunt by establishment figures who endangered national security with reckless foreign entanglements. "These were the people that had been there, long-time Washington establishment people that have been there for a long time. Look at the terrible job they've done," Trump told the Fox Business Network this week. "I hadn't planned on using any of these people."